How do I delete all shifts? 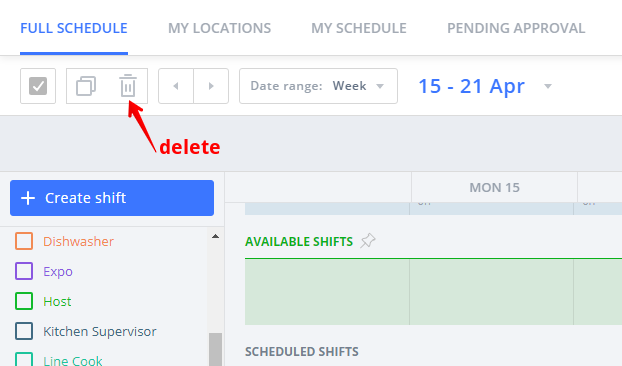 Switch to the view of the range of shifts you want to delete (Day/Week/Month/Custom/etc) and click the Select all shifts check box. Note that this will select unassigned and available shifts, as well. They will need to be deselected manually if you'd like to keep them. Once it’s checked a trash can icon will appear and you can click this to delete all shifts in view. This will not delete anything outside of the current view. You will need to repeat it for any day, week, or month you want to remove. Premium and Business accounts can also use the Custom range to remove up to 120 days at once.